Taking safety as our prior concern, we have been making continuous investment in our product certifications and professional training for nearly 30 years. Starting with the first certificate for our safety surface in 1988, our products have successfully obtained international recognitions for their safety and physical performance. We are one of the first manufacturers in Hong Kong who possesses internal Certified Playground Safety Inspector (CPSI). The certification of CPSI is awarded by the National Playground Safety Institute (NPSI), a well-recognized institute sponsored by National Recreation and Park Association (NRPA) in USA promoting children safety through playing in parks and recreational areas. 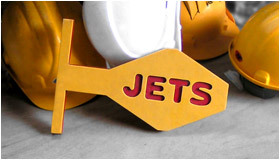 Jets is a corporate member of IPEMA, the International Play Equipment Manufacturers Association. IPEMA is a member-driven, international trade organization that represents and promotes an open market for manufacturers of play equipment. The American Society for Testing and Materials (ASTM) is a scientific and technical organization that is a major developer of standards for testing different types of materials. The majority of our play equipment are designed for complying with ASTM F-1487. An industry certification process issued by the International Organization for Standardization (ISO). elit. It is used to measure manufacturing standards and to certify company compliance with quality control systems covering design, development, production, installation, inspection and testing. The German Technischer Uberwachungs-Verein (TUV), has one of the most comprehensive and advanced testing and approval procedures in the world. With safety being our top priority, we have been working with TUV for many years to obtain certificate for our play equipment. The Singapore Green Labelling Scheme (SGLS) is to endorse consumer products and services that have less undesirable effects on our environment. This is administered by the Singapore Environment Council (SEC) which is an independent and non-government organisation in Singapore.